Latest entry in the Books That Changed the World series, this one summarizing and analyzing what is arguably the most influential treatise on warfare ever written. Strachan (History of War/Oxford; The First World War, 2004, etc.) spends as much time agonizing over the difficulty of his task as he does executing it. The textual difficulties with Clausewitz are indeed formidable. 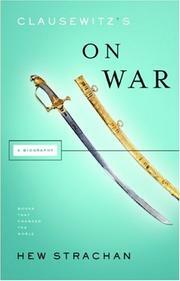 As Strachan—a persistent and imaginative scholar—ably shows, On War is a work in progress: unfinished, self-contradictory, tentative in places, dogmatic in others, grounded firmly in its author’s battle experiences during the Napoleonic wars. Strachan also notes that there are no great English translations of the multi-volume work, which first appeared in Berlin between 1832 and 1834, and that translators have disagreed on how to render some of Clausewitz’s key terms. Unfortunately, this sort of close textual analysis and attendant hand-wringing go on far too long for the general reader. Some 30 pages in, Strachan finally introduces us to Clausewitz and swiftly summarizes his career. (He’d served in the Prussian army and even appeared at the margins of Waterloo.) This is interesting, but it’s followed by more pages devoted to Clausewitz’s style, diction and dialectics; these will no doubt appeal to fellow historians of war but will send many other readers to the Land of Nod. Once Strachan finally begins to conduct his tour of On War, interest once again revives. He explores the differences between strategy and tactics, considers Clausewitz’s concept of absolute victory, examines the notions of escalation and balance of power. Although the author resists facile contemporary applications of the principles in On War, he does allude to Colin Powell’s admiration for Clausewitz, and some later sentences about insurgencies seem pregnant with present relevance. Too often obfuscates rather than illuminates its celebrated subject.